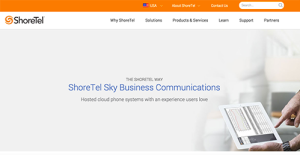 Shoretel Sky is a suite of cloud-hosted phone systems designed to unify all business communication processes, ranging from standard phone calls, video conference calls with active web sharing functionality, mobile communications, and customer engagement, to name a few. Feature rich and robust, ShoreTel Sky is a perfect business communications platform for organizations that do not want or need to set up their phone systems on-site. It being a cloud-hosted solution, Shoretel Sky management does all the configuring and managing of the system, enabling users to focus on their business and achieve their goals. With it, you won’t have to worry about complex installations, regular updates, or recurrent costs. What is even better is that you get to share all of your specific business needs, and obtain a price that will cater to them in the best possible way. ShoreTel Sky currently holds a position on our Top 10 Communications software list, where it is mentioned mostly because of its friendly interface, complete functionality suite, and reliable customer support. The leader in the category is RingCentral, with a current expert score of 9.6/10. Shoretel Sky offers a long list of benefits for businesses and organizations that are looking to a communications platform that offers it all without the added cost of purchasing hardware, additional software licenses, and IT expertise. To help you familiarize with what this product can do for your company, we summarized some of its most prominent advantages. To start with, this system is designed to enhance productivity in diverse corporate environments, both by improving the quality of meetings and web conferences, and by enabling users to participate actively, contribute to all discussions and activities, design beautiful presentations, and share video files in an environment they find comfortable. ShoreTel Sky won’t restrict you to use a specified communication channel, but it will instead provide numerous high-quality possibilities for teams to stay connected. Another ShoreTel advantage is its full mobile optimization, which means that you can connect your mobile device to the desktop phone, communicate and govern all operations when out of office. Remote teams will certainly appreciate such possibility, together with the instant alerts and notifications that ensure an agent will never miss a call. At the same time, there will be a robust collaboration suite to help agents cooperate on common matters, and reassign tasks upon need. ShoreTel Sky blends easily in diverse software ecosystems, due to the many partnerships with popular ERP and CRM providers. If you integrate it with your business intelligence app, on the other hand, you will be able to export valuable communication-related data for reporting purposes. Companies have diverse needs and requirements and no software application can be just right in such a condition. It is pointless to try to find a perfect off-the-shelf software app that meets all your business requirements. The wise thing to do would be to modify the solution for your unique needs, employee skill levels, budget, and other factors. For these reasons, do not hurry and invest in well-publicized popular systems. Though these may be widely used, they may not be the perfect fit for your specific requirements. Do your homework, look into each short-listed platform in detail, read a few ShoreTel Sky reviews, call the maker for clarifications, and finally select the app that provides what you require. How Much Does ShoreTel Sky Cost? ShoreTel Sky’s SMB and enterprise pricing information is available only upon request. Contact the company for more details, and ask for your quote. We realize that when you make a decision to buy Communications Software it’s important not only to see how experts evaluate it in their reviews, but also to find out if the real people and companies that buy it are actually satisfied with the product. That’s why we’ve created our behavior-based Customer Satisfaction Algorithm™ that gathers customer reviews, comments and ShoreTel Sky reviews across a wide range of social media sites. The data is then presented in an easy to digest form showing how many people had positive and negative experience with ShoreTel Sky. With that information at hand you should be equipped to make an informed buying decision that you won’t regret. What are ShoreTel Sky pricing details? What integrations are available for ShoreTel Sky? If you need more information about ShoreTel Sky or you simply have a question let us know what you need and we’ll forward your request directly to the vendor.